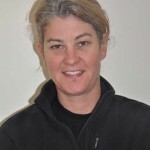 We’re back on site at Clarence for the final trip of 2012 with a select team led by WA Museum’s Vicki Richards and AHSPP Project Manager Cass Philippou. Staff and volunteers from University of Western Australia, the WA Museum, Heritage Victoria, the Maritime Archaeology Association of Victoria, the Australasian Institute for Maritime Archaeology and Flinders University are being guided by PDS Diver Supervisor James Parkinson, this time to deploy the final stage of the reburial materials. 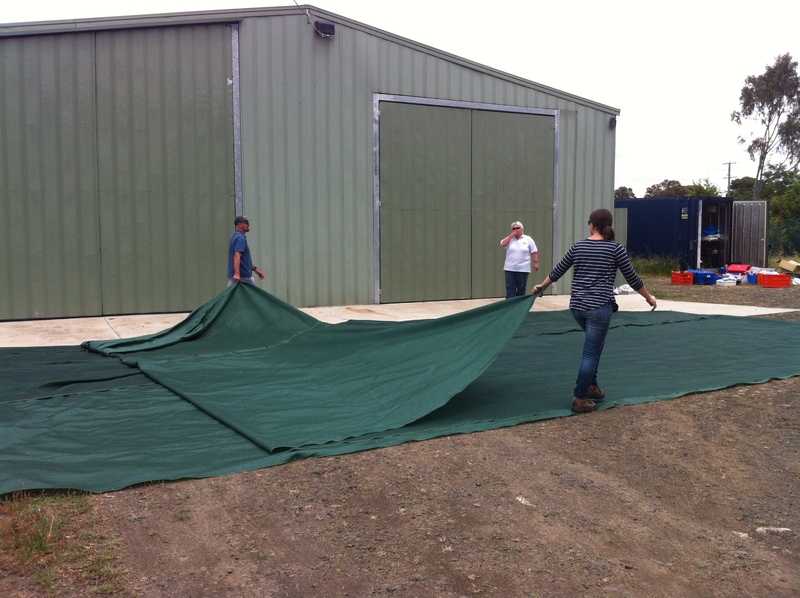 We arrived at St Leonards last Friday after a day spent at Heritage Victoria’s storage yard preparing a huge 10m x 25m shade cloth cover for Clarence. Hundreds of cable ties and many lengths of PVC pipe, tape and bungee cords were used to hold the wrapped tarp in position ready for the carefully planned unrolling and unfurling on the site. 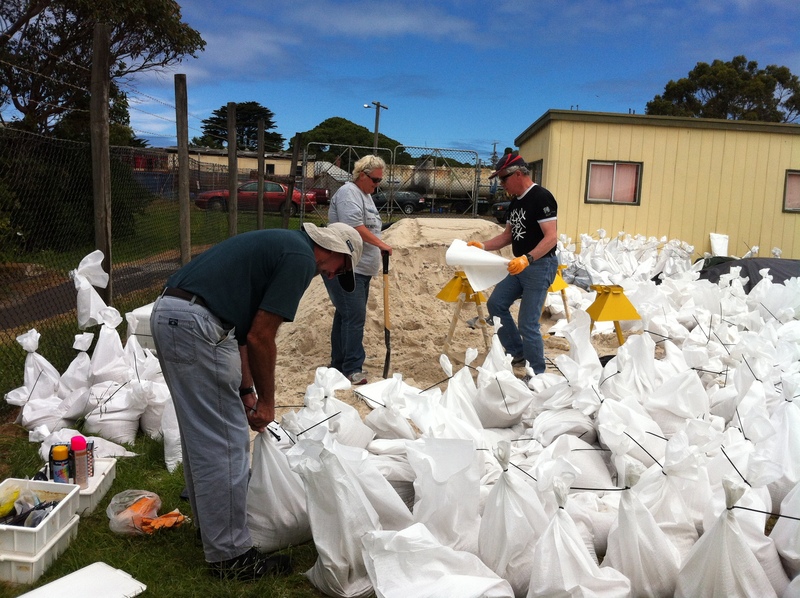 After delivering Trim to the Marine Sciences Laboratory yard, we headed to the volunteer Coast Guard station at Queenscliff and were welcomed by 20 cubic metres of sand and 2 cubic metres of heavy crushed rock. Creating nearly 2000 sandbags is to be our lives for the next few days. These sandbags are to hold down Clarence’s new covering of shade cloth and the three 7m x 14 m PVC tarps that will protect the entire wreck. Jon, Vicki & Toni preparing the shade cloth cover for Clarence (Photo by Cass Philippou). And so we perfected the art of sandbagging. In just over two days we have filled more than 1600 bags with sand and 200 bags with the heavier rock. We have hauled them onto the back of the truck, thrown them off again at the dock, slid them onto the boats and thrown them overboard at the site in a carefully coordinated pattern. Toni & Jane on INXS, off to drop sandbags on Clarence (Photo by Rhonda Steel). 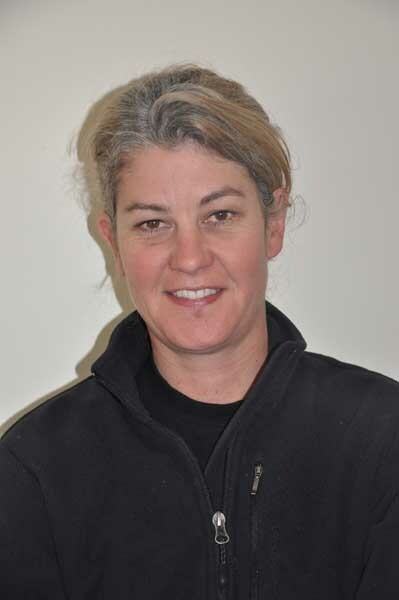 Thankfully Partner Investigator Dr Ian MacLeod kindly volunteered to give head and shoulder massages to all those who required it after a hard day shovelling sand – which was remarkable considering he had spent the days filling sandbags as well. 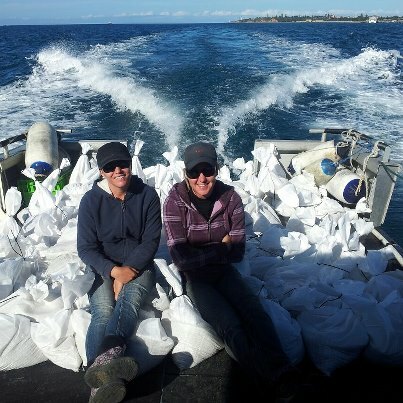 Trim was put into the water on Saturday with a snorkelling party on a reconnaissance mission to check out the Clarence and see how the sandbags and shade cloth we put down in June was holding up. Visibility wasn’t great but we could see that the wreck looked well covered still and a thick layer of weed had grown over the sandbags in the preceding four months – so much weed in fact you couldn’t fully appreciate how many sandbags are actually already at the site. The first tethered SCUBA dives took place that afternoon. James Parkinson and I took photographs of the wreck which turned out to be mostly photographs of green weed with the wreck hiding somewhere underneath. The sacrificial samples were uncovered. Their positions were measured and stakes were hammered into the sand to mark their location for access over the next few years. The second team, Scotty Allen and Enrique Aragon, began the task of moving some of the old sandbags in close to the wreck to support the frames at the port bow. After that brief in-water interlude, Sunday and Monday was back to sandbags and the mammoth task of ferrying them to the site. With the help of Steve and his work boat INXS and Peter Harvey and Trim we finally got 1600 bags onto the site – mostly where they should be! Just 200 were left at the dock for transfer later in the program. The shade cloth laid down in June was removed in a quick dive on Monday afternoon ready for Vicki Richards and Jon Carpenter to begin taking their core samples in the morning. The Clarence is now ready for final photographs and tests before being buried in a shroud of shade cloth, PVC tarps and bags and bags of sand.